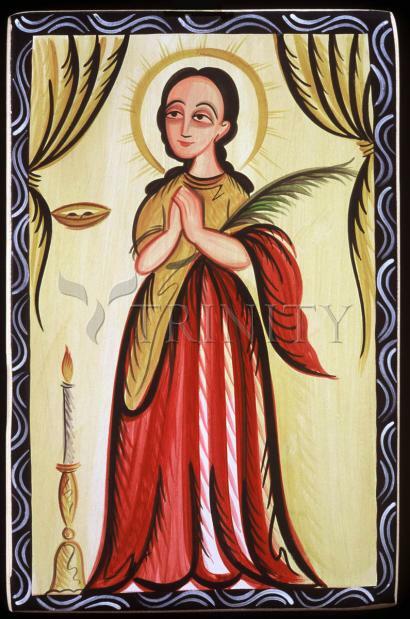 Santa Lucia was a 4th century Christian martyr from Syracuse who had vowed her virginity to God. For three years she managed to rebuff the advances of a nobleman. To make herself unattractive she plucked out her eyes but God restored them. The outraged suitor accused her of being a Christian and Lucia was condemned to labor in a house of ill-fame. She persisted in her faith and was condemned to be burned during the persecutions of the emperor Diocletian. The fires did not consume her and so she was ultimately stabbed in the neck. In religious art Santa Lucia is often shown holding her eyes in a platter and has become a patron of people suffering from eye ailments. Her feast day is December 13. Lucy was a rich, young Christian who vowed her life to Christ. Her Roman father died when she was young. Her mother, Eutychia, arranged a marriage for her. For three years she managed to keep the marriage on hold. To change the mother's mind about the girl's new faith, Lucy prayed at the tomb of Saint Agatha, and her mother's long haemorrhagic illness was cured. Her mother agreed with Lucy's desire to live for God, and Lucy became known as a patron of those with maladies like her mother's. Her rejected pagan bridegroom, Paschasius, denounced Lucy as a Christian. The governor planned to force her into prostitution, but when guards went to fetch her, they could not move her even when they hitched her to a team of oxen. The governor ordered her killed instead. After torture that included having her eyes torn out, she was surrounded by bundles of wood which were set afire; they went out. She prophesied against her persecutors, and was executed by being stabbed to death with a dagger. Legend says her eyesight was restored before her death. This and the meaning of her name led to her connection with eyes, the blind, eye trouble, etc.